As I’m working through the backlog of projects that my Christmas vacation generated I’m trying to keep this blog as simple as possible so that I can catch up. I’m also posting more in depth how-tos to Instructables. 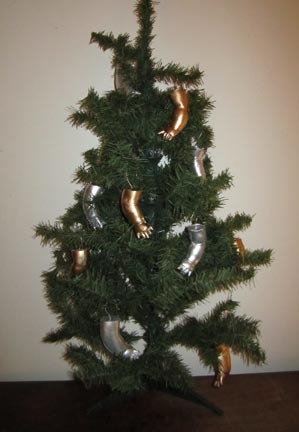 This one was created specifically to try and win a holiday decoration contest on the Instructables site. Unfortunately I didn’t win but thanks to everyone who voted for me. I had already started the mold making process on the baby hands (as in I bought the plastic hands 6 months ago) because I want to re-create a project I did about 10 years ago of making stove burner knobs out of baby hands cast in aluminum. This one helped me move that project forwards a little bit and I got a new batch of holiday decorations! Categories Around the House, Misc.